President Trump leaves the White House on Nov. 17, 2018. There shouldn’t be much question about whether 2018 was a wave election. Of course it was a wave. You could endlessly debate the wave’s magnitude, depending on how much you focus on the number of votes versus the number of seats, the House versus the Senate versus governorships, and so forth. Personally, I’d rank the 2018 wave a tick behind both 1994, which represented a historic shift after years of Democratic dominance of the House, and 2010, which reflected an especially ferocious shift against then-President Barack Obama after he’d been elected in a landslide two years earlier. But I’d put 2018 a bit ahead of most other modern wave elections, such as 2006 and 1982. Your mileage may vary. 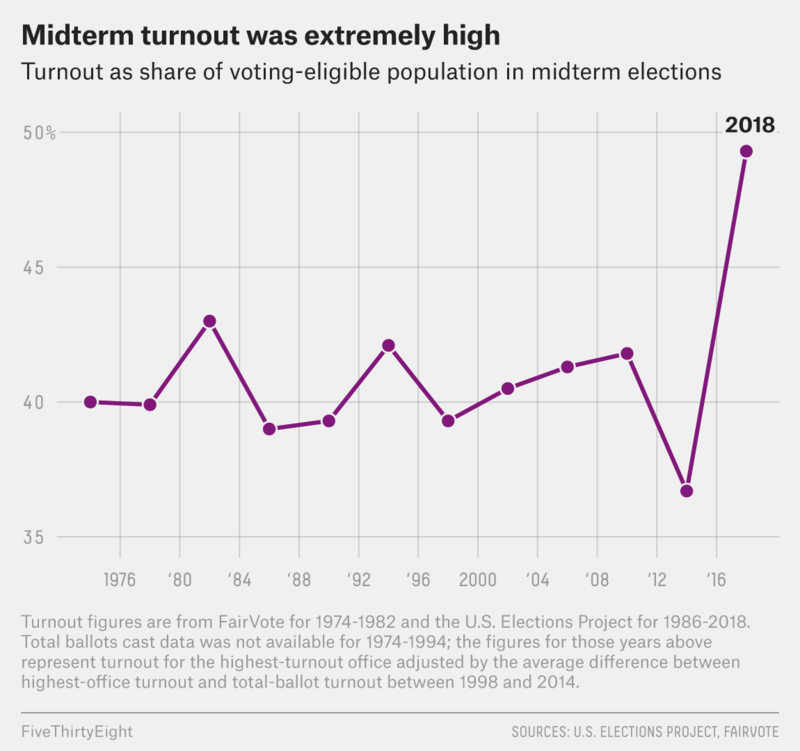 In another important respect, however, the 2018 wave was indisputably unlike any other in recent midterm history: It came with exceptionally high turnout. Turnout is currently estimated at 116 million voters, or 49.4 percent of the voting-eligible population. That’s an astounding number; only 83 million people voted in 2014, by contrast. This high turnout makes for some rather unusual accomplishments. For instance, Democratic candidates for the House will receive almost as many votes this year as the 63 million that President Trump received in 2016, when he won the Electoral College (but lost the popular vote). As of Tuesday midday, Democratic House candidates had received 58.9 million votes, according to the latest tally by David Wasserman of the Cook Political Report. However, 1.6 million ballots remain to be counted in California, and those are likely to be extremely Democratic. Other states also have more ballots to count, and they’re often provisional ballots that tend to lean Democratic. In 2016, Democratic candidates for the House added about 4 million votes from this point in the vote count to their final numbers. So this year, an eventual total of anywhere between 60 million and 63 million Democratic votes wouldn’t be too surprising. There isn’t really any precedent for the opposition party at the midterm coming so close to the president’s vote total. The closest thing to an exception is 1970, when Democratic candidates for the House got 92 percent of Richard Nixon’s vote total from 1968, when he was elected president with only 43 percent of the vote. Even in wave elections, the opposition party usually comes nowhere near to replicating the president’s vote from two years earlier. In 2010, for instance, Republican candidates received 44.8 million votes for the House — a then-record total for a midterm but far fewer than Barack Obama’s 69.5 million votes in 2008. “The resistance” turned out voters in astonishing numbers, performing well in both traditional swing states in the Midwest — including the states (Wisconsin, Michigan and Pennsylvania) that essentially lost Hillary Clinton the presidential election in 2016 — and new-fangled swing states such as Arizona and Texas. Turnout among young voters was high by the standards of a midterm, and voters aged 18 to 29 chose Democratic candidates for the House by 35 points, a record margin for the youth vote in the exit-poll era. The Hispanic share of the electorate increased to 11 percent from 8 percent in the previous midterm, according to exit polls. To some extent, these are stories the media missed when it was chasing down all those dispatches from Trump Country. In a descriptive sense, this was a really big story. In a predictive sense, what it means is less clear. Sometimes — as was the case in 2006, 1974 and 1930 — midterm waves are followed by turnover in the presidency two years later. But most presidents win re-election, including those who endured rough midterms (such as Obama in 2010, Bill Clinton in 1994 and Ronald Reagan in 1982). Nor is there any obvious relationship between how high turnout was at the midterm and how the incumbent president performed two years later. Democrats’ high turnout in 1970 presaged a landslide loss in 1972, when they nominated George McGovern. This year’s results do serve as a warning to Trump in one important sense, however: His base alone will not be enough to win a second term. Throughout the stretch run of the 2018 midterm campaign, Trump and Republicans highlighted highly charged partisan issues, from the Central American migrant caravan to Brett Kavanaugh’s confirmation to the Supreme Court. And Republican voters did indeed turn out in very high numbers: GOP candidates for the House received more than 50 million votes, more than the roughly 45 million they got in 2010. But it wasn’t enough, or even close to enough. Problem No. 1 is that Republicans lost among swing voters: Independent voters went for Democrats by a 12-point margin, and voters who voted for a third-party candidate in 2016 went to Democrats by 13 points. Nonetheless, it does mean that Republicans can’t win the presidency by turning out their base alone, a strategy that sometimes is available to Democrats. (Obama won re-election in 2012 despite losing independents by 5 points because his base was larger.) In the exit polling era, Republicans have never once had an advantage in party identification among voters in presidential years. George W. Bush’s Republicans were able to fight Democrats to a draw in 2004, when party identification was even, but that was the exception rather than the rule. I don’t want to go too far out on a limb in terms of any sort of prediction for 2020. In fact, lest you think that the midterms were the first step toward an inevitable one-term Trump presidency, several facts bear repeating: Most incumbent presidents win re-election, and although Democrats had a strong midterm this year, midterm election results aren’t strongly correlated with what happens in the presidential election two years later. Moreover, presidential approval numbers can shift significantly over two years, so while Trump would probably lose an election today on the basis of his approval ratings, his ratings today aren’t strongly predictive of what they’ll be in November 2020. But presidents such as Reagan, Clinton and Obama, who recovered to win re-election after difficult midterms, didn’t do it without making some adjustments. Both Reagan and Clinton took a more explicitly bipartisan approach after their midterm losses. Obama at least acknowledged the scope of his defeat, owning up to his “shellacking” after 2010, although an initially bipartisan tone in 2011 had given way to a more combative approach by 2012. All three presidents also benefited from recovering economies — and although the economy is very strong now, there is arguably more downside than upside for Trump (voters have high expectations, but growth is more likely than not to slow a bit). Trump’s political instincts, as strong as they are in certain ways, may also be miscalibrated. Trump would hate to acknowledge it, but he got most of the breaks in the 2016 election. He ran against a highly unpopular opponent in Clinton and benefited from the Comey letter in the campaign’s final days. He won the Electoral College despite losing the popular vote — an advantage that may or may not carry over to 2020, depending on whether voters in the Midwest are willing to give him the benefit of the doubt again. Meanwhile, this year’s midterms — as well as the various congressional special elections that were contested this year and last year — were fought largely on red turf, especially in the Senate, where Trump may well have helped Republican candidates in states such as Indiana and North Dakota. The Republican play-to-the-base strategy was a disaster in the elections in Virginia in 2017 and in most swing states and suburban congressional districts this year, however. At the least, odds are that Trump needs a course-correction, and it’s anyone’s guess as to whether he’ll be willing to take one. While there’s some speculation that Trump could move in a more bipartisan direction, that hasn’t really been apparent yet in his actions since the midterms, or at least not on a consistent basis. Instead, he’s spent the first fortnight after the midterms firing his attorney general, implying that Democrats were trying to steal elections in Florida, and bragging about how he’d give himself an A-plus rating as president. The next two years will less be a test of Trump’s willpower than one of his dexterity and even his humility — not qualities he’s been known to have in great measure. And arguably in the House of Representatives and the Electoral College — although those advantages may not be as sustainable.